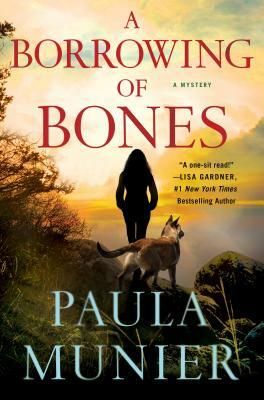 Thursday, September 13th, 2018, 5:30 p.m.
Paula Munier visits Gibson's Bookstore to present A Borrowing of Bones, a gripping police procedural with canine companionship. It may be the Fourth of July weekend, but for retired soldier Mercy Carr and her Belgian Malinois Elvis, it’s just another walk in the beautiful remote Vermont wilderness—until the former bomb-sniffing dog alerts to explosives and they find a squalling baby abandoned near a shallow grave filled with what appear to be human bones. U.S. Game Warden Troy Warner and his search-and rescue Newfoundland Susie Bear respond to Mercy’s 911 call, and the four must work together to track down a missing mother, solve a cold-case murder, and keep the citizens of Vermont safe on potentially the most incendiary Independence Day since the American Revolution. A Borrowing of Bones is full of complex twists and real details about search-and-rescue dog training that Paula learned through the training of her own dog. With its canine sidekicks and procedural plot, this series is a must-have for mystery fans. About the author: Paula Munier is the author of the bestselling Plot Perfect, The Writer’s Guide to Beginnings, Writing with Quiet Hands, and Fixing Freddie: A True Story of a Boy, a Mom, and a Very, Very Bad Beagle. She was inspired to write A Borrowing of Bones by the hero working dogs she met through MissionK9Rescue, her own Newfoundland retriever mix rescue Bear, and a lifelong passion for crime fiction. In her fabulous day job, she works as Senior Agent and Content Strategist for Talcott Notch Literary, representing many great crime writers. She lives in New Hampshire with her family, Bear, and a torbie tabby named Ursula.